The painting is oil and sand mixed on board. Collection of Farhat Art Museum. “Agi” Sims is known for paintings and sculptures inspired by prehistoric rock art of New Mexico. Born in Devon, Pennsylvania, Sims attended the Pennsylvania Academy of Fine Art and the Philadelphia School of Design for Women. She managed a traveling marionette theater before establishing herself as a textile and needlework designer in Philadelphia. After a visit to New Mexico in 1938, Sims returned to Philadelphia, packed her belongings, and returned to make Santa Fe her permanent home. She opened a classical record store in an eighteenth-century farmhouse on Canyon Road, but the shortage of shellac during the War put her out of business. Sims then became a building contractor (skills taught her by her contractor father), purchasing and renovating historic houses around Santa Fe. She later bought a nineteenth-century house with acreage on Canyon Road and built a compound including a house for herself and one for her long-time partner, Mary Louise Aswell, the fiction editor at Harper’s Bazaar who had brought writers such as Eurdora Welty and Truman Capote to the public’s attention. Shortly after her arrival, a friend introduced Sims to the Galisteo Basin south of Santa Fe which was dotted with the ruins of prehistoric Indian Pueblos, and home to tens of thousands of ancient petroglyphs. The rock art captivated Sims and became her primary inspiration for the rest of her career. Over the next decade she recorded 3000 petroglyphs in drawings and thousands more in photographs. 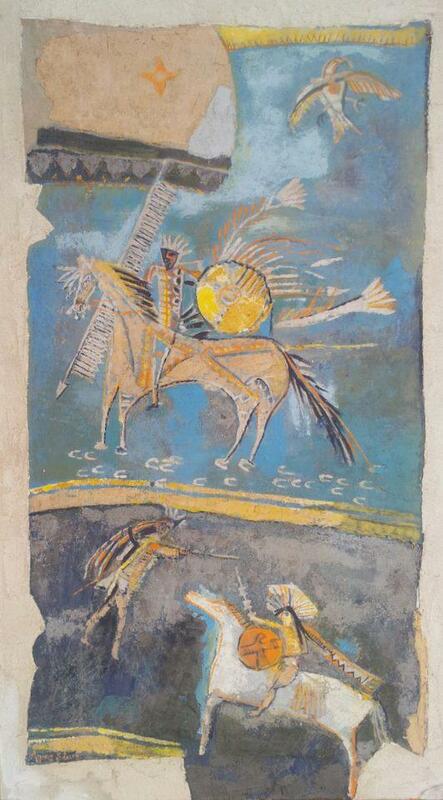 In 1949 she received a grant from the American Philosophical Society to further her research, and in 1950 she published a portfolio of selected rock at drawings in her monograph, San Cristobal Petroglyphs. Most of Sims paintings and sculptures were inspired by petroglyphs, but unlike her documentary drawings they never were literal copies. Rather she adopted and adapted the two-dimensional representations of people and animal into an art that fit comfortably into the larger world of mid-century modernism. She used simple, idiosyncratic figures to create her own symbolism, the original meanings of the ancient art being mostly lost to the past. Sims worked in a wide array of media. Her oil paintings on canvas often were mixed with an earthen medium which gave them a rough, stone-like texture. She developed a batik-like resist process for painting on cloth, and used it to produce large, un-stretched wall hangings. She used this technique to produce an architectural frieze 3.5 feet high and almost 150 feet long which still adorns the Century Bank lobby in downtown Santa Fe. Sims was a prolific sculptor, working in wood, stone, bronze, terracotta, fiberglass, and polyester. Sims was given one-woman shows at the Brooklyn Museum, U.S. Embassy in London, Folger Library, Colorado Springs Fine Art Center, Santa Barbara Museum of Art, McNay Art Institute in San Antonio, Texas, and the Museum of Fine Art in Santa Fe. She also showed her work at the gallery she owned on Canyon Road. At times, she rented studio space in her gallery building to local artisans, hoping to spark a revival of early New Mexico arts and crafts. Although she did not offer formal instruction, Sims was known for her generous encouragement of younger artists. In the large patio of the Canyon Road compound, she hosted public performances of original dance, music, and theater and readings by local authors. She also was known for her love of good food and scotch and living strictly on her own terms. She was honored with the New Mexico Governor’s Award for Excellence and Achievements in the Arts a few months before her death from Alzheimer’s disease in 1990.